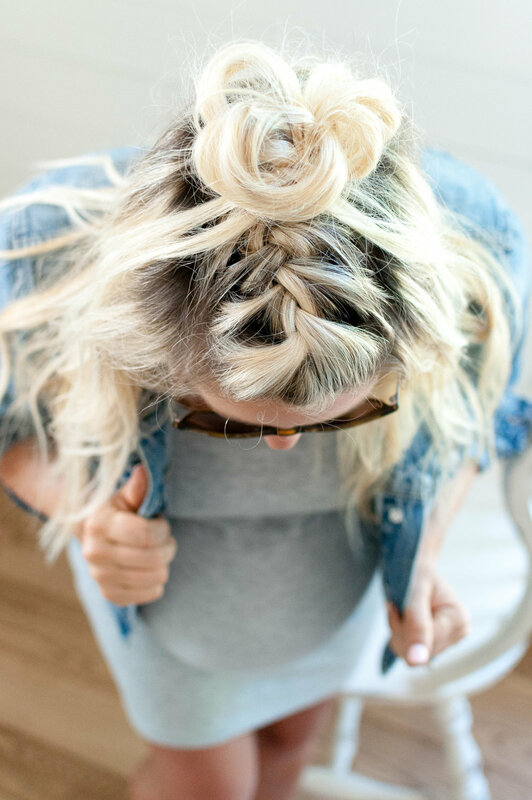 Writing outfit posts is something new for me, and I’m sure it has to do with being pregnant. I’ve said it before, that I love having a baby bump, I feel more confident with my body than any other time in my life. Of course, I have the usual physical complaints of sore feet at the end of the day, limited mobility, and the 3rd trimester water retention, but overall I really enjoy being pregnant. Which has lead me to have the confidence to share photos of myself more. I’ve really enjoyed being in my 3rd trimester during warmer months, mostly because pants are becoming more uncomfortable and a dress is all I want to throw on. There are many maternity dresses out there, but I have found that I’m most comfortable in a fitted yet stretchy dress that has plenty of give but shows that I’m clearly “with child” and not just hiding several months of over-eating! I have this dress in 4 different colors and have had so much fun creating different looks with it. I wear a large in this dress, which gives the bump plenty of room and I have only the slightest complaint, which is that the straps are a little long in the size large, sometimes leaving my chest more exposed than I prefer. If your chest is smaller, I recommend trying a size medium, or even a different cut. Below are 4 different looks I wore in 1 week – not one item pictured below is maternity!! Sources are linked below each style section. I styled the grey version with a denim jacket, white sneakers, some gold hoops, and my favorite hairstyle as of late – the Mohawk braid. This is the perfect look for trekking around the city or a coffee date. The black dress with a gray shirtdress, left open. I styled with my hair pulled back in a low braided bun to show off the teal tassel earrings. The neutral shoe color gives the illusion of longer legs which I appreciate, as I continue to expand horizontally. The thick heel lends support during the quick walk to our date destination. The pale pink is my favorite color; however, it doesn’t hide much so I suggest wearing something over the lighter color. I paired it with a light weight kimono which kept the look feminine and whimsical. I’ve also paired it with the grey shirtdress pictured above, keeping an overall muted pastel look. Navy is my favorite color in the dress and the version I wear most often. I usually pair with a long, thin sweater so that the outfit is not too revealing. I wore this exact combo on 3 of the 4 plane rides in the last 3 weeks and felt incredibly comfortable. Even the stretchiest yoga pants tend to pinch my abdomen after sitting for so long, but this dress gave me plenty of mobility and left my legs and bump feeling free.